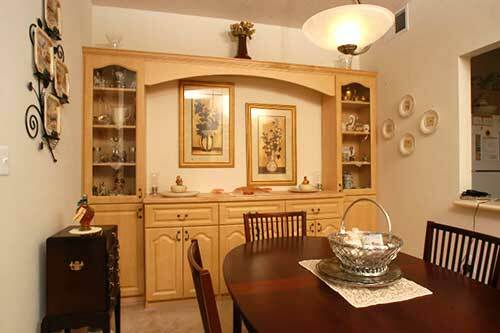 Dining Room with Wine Rack Cabinet. We have years of experience in designing and manufacturing dining room bars. To see pictures of some of the bars we have designed and manufactured, please visit our sister company qualityhomeimprovementservices.com experience, and then on Bar to see some of the pictures of Bars and dining room bars we have manufactured over the years. A European Closets, Inc. we blend unwavering commitment, design expertise, and top quality products in manufacturing your dining room bar. Whether it is a small dining room bar, or a large bar with wine racks, glass racks, and Plexiglas doors we can help you. 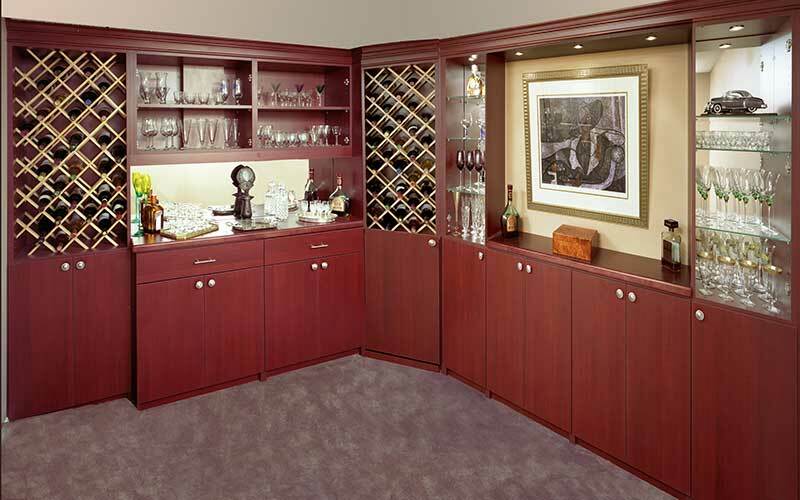 Our design experts will design an easy to store and safe storage system while doing your dining room bar. We have been serving VA, DC, MD since 1980 and specialize in dining room bars and a well designed dining room bar will impress your guests. When it comes to quality, service and attention to details European Closets is the company. We ask you to visit our showrooms or our factory and have one of our closet designers work with you. Years back we were invited by Expo Design Center which was the luxury division of Home Depot Companies to set up showrooms in their Fairfax, VA, Bethesda, MD, and Columbia, MD locations. We were invited to be there because of our attention to detail and exceptional customer service. Expo Design Center is no longer in business due to the current economic condition. Our product line extends beyond closet organizers and pantry shelving or mud rooms. We do work in almost every room of your house, whether it is the attic closet or the home office or it is the art room or the garage, we have the products and the expertise. When it comes to excellence, we don't just stand out, we stand alone. 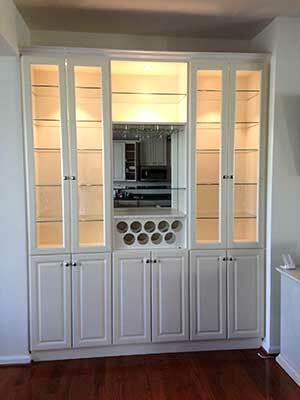 Euro Design Center (European Closet inc) is the leading designer and manufacturer of fine Custom Closet Components. We install our Closets with our highly trained team of Closet installers some with over 20 years experience with our company. We offer a large selection of Closet units to satisfy your storage needs. European Closets understands what it takes to keep a customer happy. We also carry a very comprehensive insurance for your protection. What we do is considered as a home improvement, therefore we have a Maryland Home Improvement License, this is a requirement, ask for it whenever you consider doing a closet or home office project. Our installation is done by our hourly paid employees (no sub contractors), since our closet installers are hourly paid we have 100% control over the quality and craftsmanship and cleanliness of the job. They will not rush your job. This is one of the most important aspects of a headache free job which some may look over.